The Mariinsky Theatre Orchestra is the house orchestra of the the Mariinsky Theatre in St. Petersburg, formerly Leningrad, and is also known as the Kirov Orchestra. It dates back to the 18th century and was known before the revolution as the Russian Imperial Opera Orchestra. Today the Mariinsky is known for its association with Valery Gergiev. Yevgeny Mravinsky (1903-1988) was a legendary Russian conductor who led a different orchestra, the Leningrad Philharmonic, for fifty years. Among the first performances given under Mravinsky's baton were Shostakovich's symphonies numbers 5,6,8,9, 10 and 12. But the story of Mravinsky and the Mariinsky are intertwined. Yevgeny Mravinsky was the nephew of the Mariinsky's star diva Yevgeniya Mravina. He literally grew up in the famous theatre where he worked as an extra while studying, and in 1933 made his debut there conducting Tchaikovsky's The Sleeping Beauty. Valery Gergiev's biography has him attending Mravinsky's concerts while a student in Leningrad, presumably that was when Gergiev still sat down. In 1938 Mravinsky was appointed artistic director of the prestigous Leningrad Philharmonic at the age of 35. Just three years later Germany tore up the Molotov–Ribbentrop non-aggression pact and invaded the Soviet Union in June 1941. This caused the Leningrad Philharmonic and Mravinsky to be evacuated to Novosibirsk in Siberia. Great relationships between conductors and orchestras are forged by long and intensive periods working together, and during those dark years in Siberia Mravinsky and his orchestra played in 538 concerts attended by more than 400,000 people, and in addition broadcast more than 200 radio concerts. When they returned to Leningrad in 1944 a very special alchemy had formed between the orchestra and its music director. In 1946 Mravinsky led them on their first-ever overseas tour, 1947 saw them give the first performance of Sergei Prokofiev's Sixth Symphony in Leningrad, and in 1953 they premiered Shostakovich's controversial Tenth Symphony. 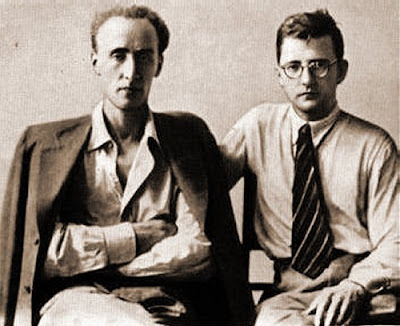 The photo below shows Shostakovich with Mravinsky in 1937. Yes, I knew him very well... Well, first of all, one has to say that he had the deepest understanding of the meaning and of the sense of Shostakovich's music. The relationship between Shostakovich and Mravinsky is a very difficult subject. There is no doubt that Mravinsky always worshipped Shostakovich. As for Shostakovich, he appreciated Mravinsky more as a marvellous interpreter of his symphonies than a personal friend. 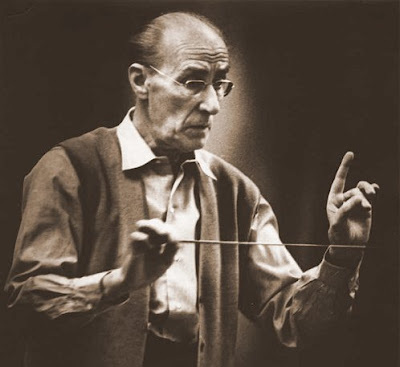 I think that in the case of the Thirteenth Symphony, Shostakovich was wrong by arguing that Mravinsky feared the political consequences of the premiere. I don't think so. I rather believe something else: Mravinsky was, in fact, a man of fear. I would argue that he was afraid for the choir and the soloist and the possible problems that might have arisen by their playing this work. This was, in my opinion, a supplementary factor that made his decision not to play the work. I don't think - and I knew him very well - that he was afraid himself of political consequences. Yevgeny Mravinsky's entire life and career were overshadowed by the fear of political consequences, and he did not live to see the Revolutions of 1989 that started with the fall of the Berlin wall and ended with the collapse of the Soviet Union. He died in 1988, still artistic director of his Leningrad orchestra. Two other legendary conductors died within two years of him, Herbert von Karajan in 1989 and Leonard Bernstein in 1990. But whereas Karajan and Bernstein's contributions to twentieth century music are recognised today, Mravinsky is a largely forgotten figure. This is doubtless explained by a lifetime spent behind the Iron Curtain, but is still surprising considering the current popularity of Shostakovich's symphonies, six of which Mravinsky premiered. We are fortunate, however, to have recordings and films to show just how great a conductor he was, and what an extraordinary relationship he had with the Leningrad Philharmonic. The Japanese value great conductors of the past more than the West, and there is a comprehensive listing of Mravinsky recordings here. Somewhat surprisingly YouTube has some very rich Mravinsky resources including a number of Shostakovich performances. 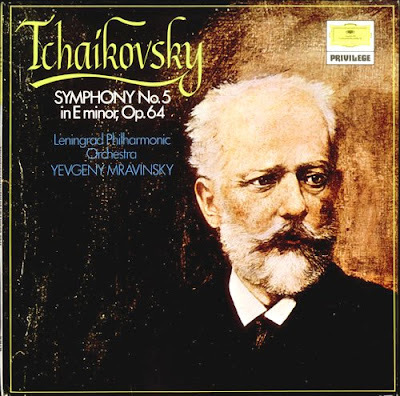 But Mravinsky's Tchaikovsky best capture the sheer electricity of his conducting, and his commitment to the composer is reflected in the eleven recordings he made of the Fifth Symphony. He recorded the last three Tchaikovsky Symphonies for Deutsche Grammophon with the Leningrad Philharmonic while on tour in London in 1960, my LP of the Fourth is seen at the start of this article. I started to listen again to this recording while I worked on this article. The problem is I didn't do any more work. For forty minutes I sat slack-jawed in front of the loudspeakers, and everything else in the house stopped as it became evident that something very special was on the turntable. These 1960 recordings of Tchaikovsky's Fourth, Fifth and Sixth Symphonies are among the most astonishing performances ever recorded. If you do red-blooded these are unmissable. If you do pre-Pro Tools, let's go for it in one take recordings, these are unmissable. If you do pre-Health and Safety orchestral playing these are unmissable. Praise be that they are still in the catalogue. I have not heard the CD transfers, and I doubt if they have the sheer visceral impact, secure soundstage and musicality of my vinyl pressings. But they will still delight anyone who wants to know the difference between Mariinsky and Mravinsky. As mentioned above the Voice of Russia website has a very useful but fallible biography of Yevgeny Mravinsky, which this post draws on. The Russian biography ends with the following story, which I am pretty sure it is apocryphal. But why let the facts get in the way of the perfect end to this tribute to a legend? Rehearsal photo of Yevgeny Mravinsky above. Valery Gergiev conducts the London Symphony Orchestra in Shostakovich's Eighth Symphony at the BBC Proms on August 24th. Read about The Year is '42 here. I was very disappointed to hear the Andris Nelsons recording of 5 on 'In Tune' the other day. It lacked the fire and red-bloodedness you talk about here. Muscularity is essential in that final trilogy of symphonies. What a crime that he is so ignored. Mravinsky is another conductor who made the hairs on my neck stand on end. His Tchaikovsky is electrifying. A lot more of his concert performances are coming out now on CD. Time to get an extra job to buy them all…. BTW. Of course the Karajan story is apocryphal. His recording of the Tchaikovsky Fifth pretty well never left the catalogues. It’s also one of the few Karajan recordings I can abide by. David, I agree with you, the story is fiction. But didn't Karajan make three different recordings of Tchaikovsky 5? - with the Philharmonia and Berlin Phil for EMI, and also with the Berlin Phil for DG. You are correct, he recorded it three times. And I have a feeling the story relates to the first DGG session, since that’s about the same time they released the Mravinksy. It’s interesting that he also recorded one of the first “complete” 1812 Overture, with the Choir. In his case, the famed Don Cossack Chorus, though I’m more than sure their performance was mixed into the mastertape. In 1938, E. Mravinsky was 35 years old, and not 25. M. Cuvellier, you are of course quite right. A stupid error by me, although in mitigation I would say it originated from the Voice of Russia biography. I just hope there are no more errors like that in the VoR biography. The error has ben corrected in my text. Very nice article! There is also a biography of Mravinsky by Gregor Tassie with the title "The Noble Conductor" and a documentary called "Soviet Conductor, Russian Aristocrat". And yes, that Karajan story is definitely apocryphal. In addition to the recordings already mentioned, he even recorded the 5th one more time in the 80s, with the Wiener Philharmoniker. It is however reportedly true that Karajan listened to Mravinsky's recordings and was fascinated by them. According to Osborne, Karajan expressed interest in working with the Leningrad Philharmonic, one of the few orchestras he was still interested in working with after he had decided to concentrate his work on Berlin, Vienna, and Salzburg (the other two were the Cleveland Orchestra and the Staatskapelle Dresden, and he did actually appear with both in Salzburg). He wanted to organize some kind of exchange project between Berlin and Leningrad, but that never materialized.